A crisp buttery pastry case with a citrus filling and hand-decorated dark chocolate topping. Double British Cream (Cows’ Milk) (26%), Sugar, Fortified Wheat Flour (Wheat Flour, Calcium Carbonate, Iron, Niacin, Thiamin), Butter (Cows’ Milk) (12%), Sicilian Lemon Curd (9%) (Sugar, Free Range Egg, Butter (Cows’ Milk), Water, Sicilian Lemon Juice from Concentrate, Gelling Agent: Agar; Sicilian Lemon Oil, Salt), Water, Free Range Egg, Lemon Juice (2%), Lime Juice, Glucose-Fructose Syrup, Acidity Regulator: Citric Acid; Palm Fat, Glycerine, Gelling Agent: Pectin; Cocoa Mass, Dextrose, Cocoa Butter, Whole Cows’ Milk Powder, Rapeseed Oil, Cornflour, Palm Oil, Emulsifier: Soya Lecithin; Flavouring. 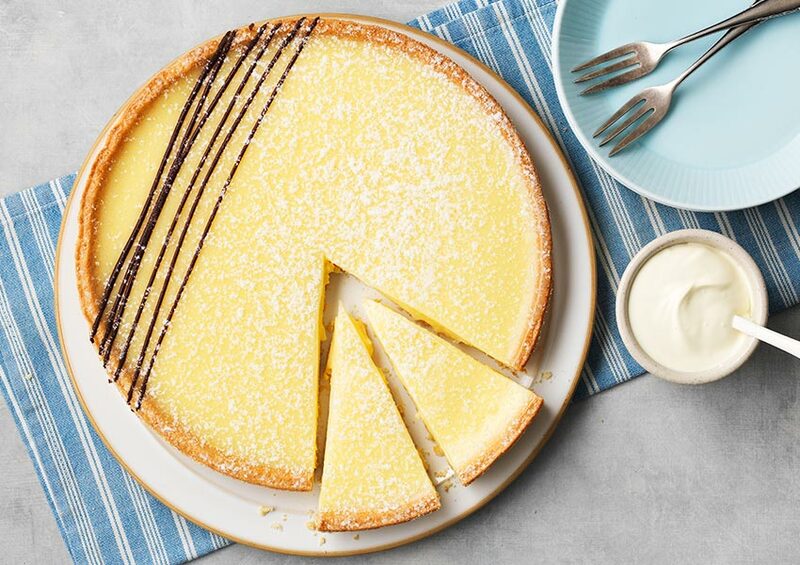 All butter pastry with a Sicilian lemon and lime filling, topped with a sweet glaze and decorated with dark chocolate and a dusting of sugar snow.